EVGA x99 Classified latest bios. I want to change the value from 512.000 to 4095.000 on both. P.S. I tried doing it with the Intel Extreme Tuning Utility but it doesn't seem to be able to save changes in the evga bios. 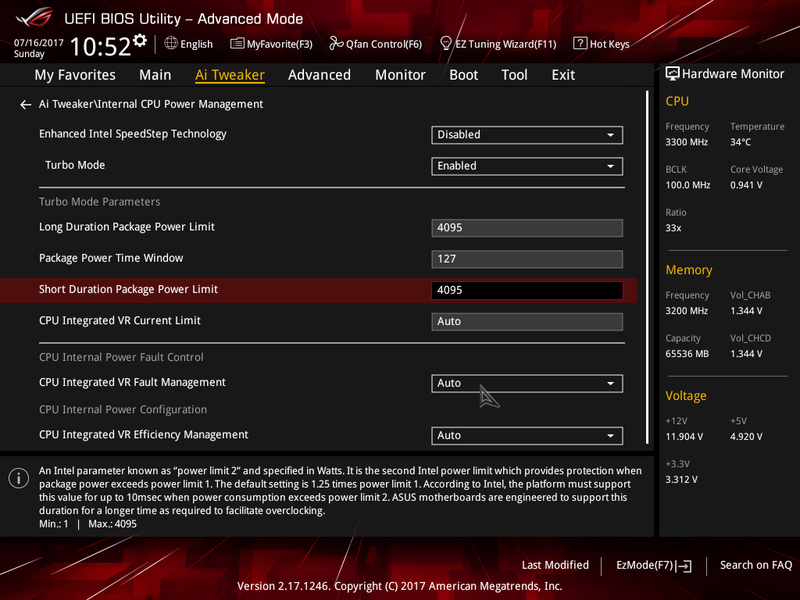 Are those options missing from the bios? I can not find them under those names. Maybe evga calls them something else? Why do you believe the value is '512' versus '4095'? There is not an option in the BIOS to set this. I remember on my X58 board under the PCI settings there was a setting for PCIe called "Maximum Payload Size". The default was 128, but it was recommended (for max performance supposedly) that it be set to 4096. I believe 512 was also one of the options there as well. Maybe that is what the OP is referring to?? So does anybody know? I called tech support and apparently this was available in my BIOS at some point on the main screen under CPU, judging by their documentation (really old docs never updated). There's very little info about evga O/C on the web. Not even youtube videos by the manufacturer with basic O/C. As far as I know, there never has been a way to adjust this in the BIOS. There are some settings that you can use with using intel's XTU app that are not exposed in the BIOS GUI. 1. The settings available in XTU are dependent on what your systems BIOS exposes to the tool. The settings available in the XTU may be different on your system. 2. Be sure to clear the CMOS on your system before using XTU to correct the BIOS settings. See the documentation for your motherboard for instructions on clearing the CMOS. 3. The voltage, power and current settings that will work for you may vary. See the section titled Customer Reported Settings for additional information." Thank you. I am so jealous of people with O/C mobos. I can't find anything on this thing. Not even an in depth overclocking article. So i finally found a solution to my problem. All i had to do was get a real overclocking motherboard. And yet all of the top 3DMark Time Spy and Fire Strike scores were set with EVGA motherboards. Too bad they aren't any good for overclocking. That's BIOS of Rampage V Extreme? Why is not EVGA motherboard good for OC? He's just confused. By default, those values are set at what he wanted. In other words, on the EVGA board, they are set at their default maximum values. You can REDUCE them on the ASUS board. So, I guess he's happy with it. I fell for that. That's because they use external equipment to change settings instead of the actual Bios. EVGA components are as flawless as Asus. The bios just has less options and slower RAM QVL. Compare Apex vs Dark and you will see.